Regular meeting at the Canberra Irish Club - unless otherwise noted here. 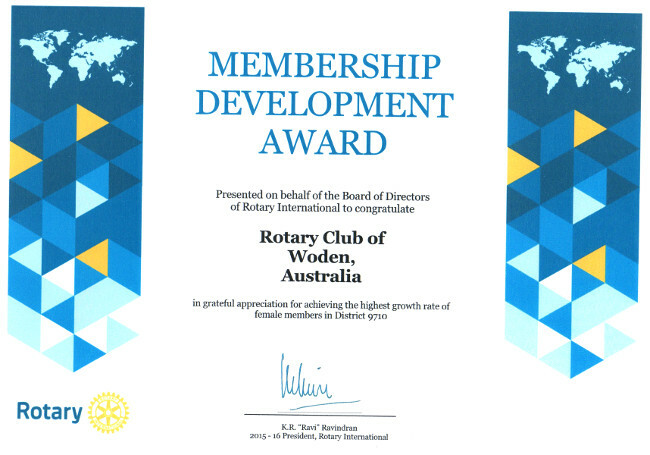 Rotary Club of Woden Inc. This is our annual non-competitive cyclo-sportive bike riding event provides a great challenge to ride the peaks around Canberra. And it's a great way to see Canberra from the saddle with support along the course, great home made food at the refreshment stations and energy snacks at the peaks. There are two ride lengths (about 117 km or 88 km if all peaks ridden). You do not have to ride up any of the peaks so your non-climbing partner can by-pass them all and ride 87 km (longer route) or 57 km (shorter route) or you can by-pass any you find too difficult. It’s an intensive and fun filled week-long program for Year 11 students from around Australia to experience ‘inside’ Canberra and to become better citizens of Australia. We select delegates with different backgrounds and from different regions of Australia. Rotary families host the delegates – normally in pairs from different states. Delegates may be sponsored by their local Rotary Club. Join Woden Rotary Club to celebrating fifty years with a complementary drink on arrival, a three course meal and great dancing with music by TOPSHELF a four-piece band with music spanning the generations from the 60s to recent dance floor favorites. All proceeds go to L’Arche supporting people living with intellectual disability in our community. All special dietary requirements need to be advised when booking tickets with the name of the person with the requirements included. If you are fasting, type fasting as dietary requirement. It’s an annual night of fun and frivolity with punting on a virtual (using videos of actual horse and dog races) using free fun money with prizes, silent auctions, and fashions in the field competitions. All proceeds go to charity. The bar is open and light snacks are provided. We have an electric-assist 'trioBike taxi' (it's a tri-shaw as illustrated) currently located at Araluen Village (in Fisher) for use by the residents as part of the Cycling Without Age program to get the residents out with the wind in their hair. If you can ride a bike and have a desire to help others, then become a pilot (we will train you and it’s a simple process). You won’t need much practise before you are on the road (or the bike path). We can park cars for your event in an effective, efficient and safe way that ensures your customers have an enjoyable parking experience and arrive at the event in a good mood. We have considerable expertise and experience with short, one-day or multi-day events. Car parking is a lot harder than it looks – especially if you want it done properly – and we do it properly. All proceeds go into our service activities and Club projects for community benefits. On Friday 23 February we held a fun night of punting with free play money, silent auctions and dress up for fashions on the field. This year we are supporting MyHome in Canberra to assist them to provide supported accommodation for people with enduring mental illness. Last year we bought an electric-assist trike for Araluen Village so that residents again feel the ‘wind in their hair’. – that will provide supported accommodation for people with enduring mental illness. 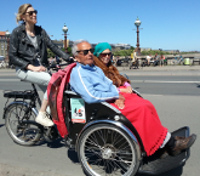 • We have purchased a trioBike taxi from Denmark (that's it in the photo) using funds raised from the Charity Vitrtual Race Night in April 2017 and the Five Peaks Chalenge 2017 bike ride. • It's a ‘a couch on wheels’ – see it in this video. • This is the third tri-shaw for Cycling Without Age in Canberra – the others are at Kangaga Waters residential aged care facility in Belconnen. We are training people to become pilots and take residents for rides in the tri-shaw – out and about, to the shops, to the lake or wherever. If you can ride a bike and have a desire to help others, then there is plenty of space for you. Our pilots are everyone from directors and senior citizens to students. You won’t need much practice before you are on the road (or the bike path). Our motto is: ‘Hurry up slowly – turn softly’. We will train you to become a pilot (it's a simple process) and advise you of the booking procedures so you and residents get together for a fun ride. There are no commitments as to your availability – you decide when you can ride and then your services are offered to residents. Or you can have regular passengers. It’s up to you and the residents. Expressions of interest to wodenrotary@gmail.com. 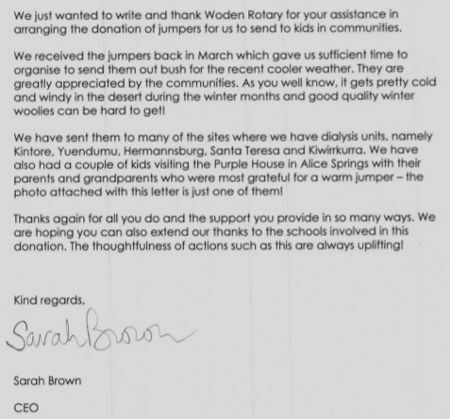 The primary school changed its badge and thus had some surplus second-hand jumpers and other clothing available that they offered to Woden Rotary. We passed them onto the WDNWPT (Western Desert Dialysis) aboriginal cooperative with whom we have a close relationship having, amongst other things, constructed some dialysis centres and nurses quarters in remote communities for them. Toll IPEC kindly transported the jumpers to Alice Springs free of charge. Here is the letter of thanks form WDNWPT and an image of a student in one of the donated jumpers. Everyone had a fun evening and we raised raised money for charity with betting with play money (no real money) on horse, dog and pig races projected onto a screen. No attendee has seen the races before. A customised race card and a wad of 'play money' is given to all attendees. And there will be fashions in the field and silent auctions. This year's charity project helped Araluen Retirement Village in Fisher acquire a trishaw electric assist bike to start a Cycling Without Age program - so residents again feel the ‘wind in their hair’ (image left). It's on again next year on Friday 23 February 2018. Rotary is a worldwide network of community volunteers. Our Canberra based Club thinks globally and acts locally and world wide.